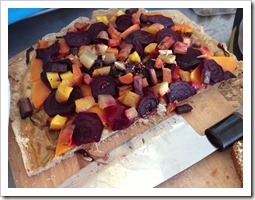 Every once in a while I like to write a short post on what we’ve been eating lately. We’re always keen to cook our own food versus buying ready-made lunches and we reserve restaurant outings for the weekends, so our kitchen is always bustling with activity. Though it’s not always easy, it’s worth the effort. We buy 90% of our weekly groceries at the farmers’ market and get staples like ketchup, mayo, etc. at Lidl or SuperValu. This means there’s a whole routine of packaging up our vegetables and bread and fish/chicken/meat when we get home from the farmers’ market, as most of it isn’t in any kind of container or wrapping. Still, we wouldn’t have it any other way. 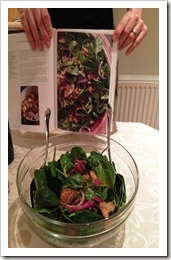 We eat incredibly well and Sunday through Friday we eat three meals a day that we’ve made ourselves. Our average cost? About €3.80 per person, per meal. Of course we’re not factoring in the effort it takes, but as I love to cook (and as Mountaineering Man is starting to get into cooking himself), we don’t mind it at all. So here’s a look into an average week for us, many of these dishes don’t have recipes as we kind of throw them together. 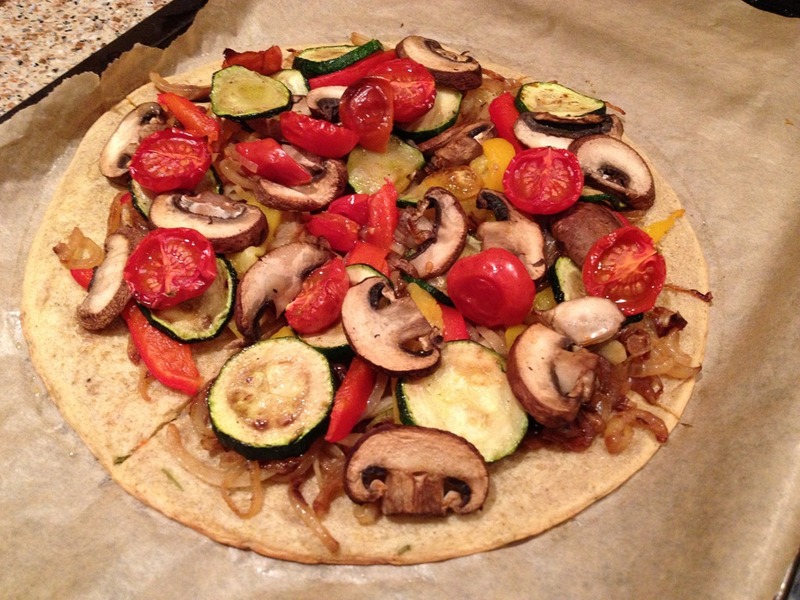 We focus on using everything we have for the week (I even write a list of what we have in the fridge every Sunday so I can better plan our meals and curb any waste) and with the exception of the weekends cook relatively simple food. MM takes a couple of sandwiches, plus oatmeal with fruit plus an apple every day for his breakfasts and lunches at work. I try to make his sambos interesting, and always use meat from the butcher and fresh bread from either il Valentino or Arun Bakery plus a variety of condiments. 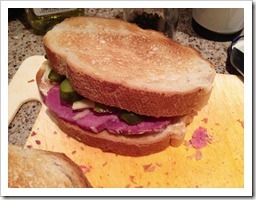 Last week he took corned beef with pickles, Edam cheese and a homemade Thousand Island sauce. My breakfast usually consist of a huge Glowing Green Smoothie, which I make at home and bring to work, and lunches are usually vegan or vegetarian. 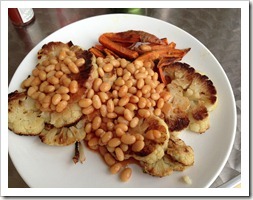 Yesterday I brought some roasted cauliflower and sweet potato topped with baked beans. 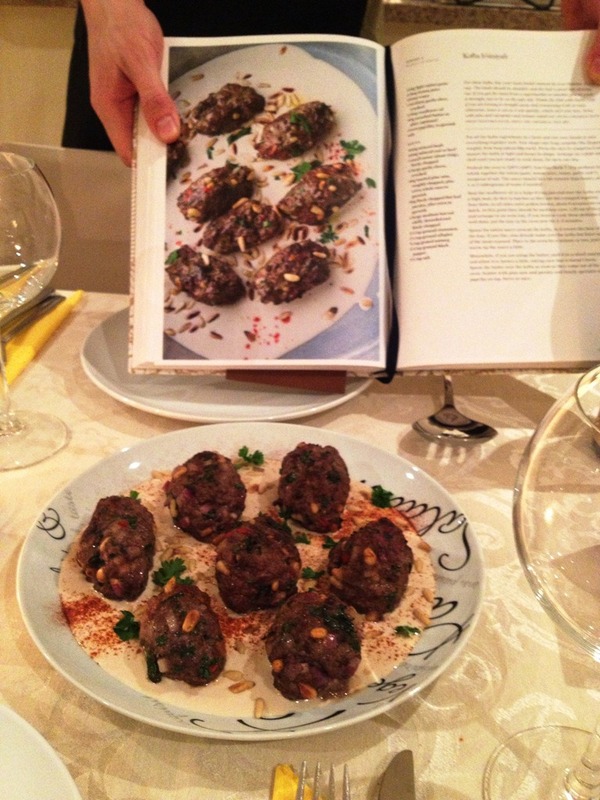 A bit odd, I know, but filling, easy and tasty. 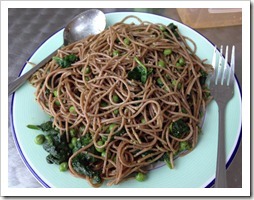 MM often cooks himself a dinner of baked fish, roasted potatoes and steamed broccoli for a healthy and quick weeknight dinner. 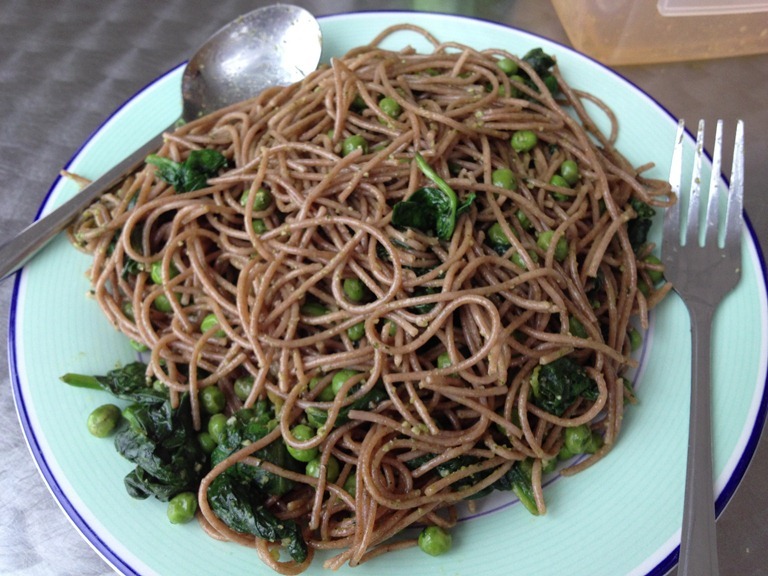 Sometimes if I’m home a bit early and have a bit of time, I’ll throw together a simple spelt spaghetti with pesto (see below for more on this) and frozen peas/spinach, or make a rustic veggie tart. 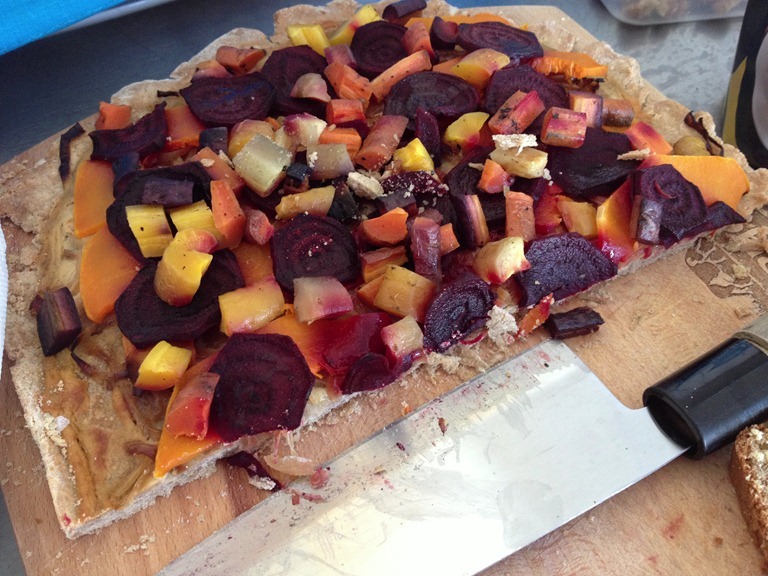 I actually made two of the above veg tarts; one for our dinner, and one to take to work to share with co-workers. I typically make a simple dough from wholemeal flour, olive oil and cold water, roll or even pat it out and then top with whatever veg I have (if it’s root veg like above, I roast them separately first). 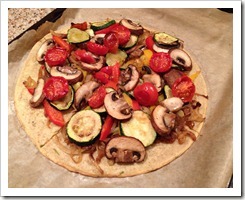 By Fridays, our fridge is almost empty but we always have a few veggies laying around so I either make a pizza or tart of some sort as both are a great way to use up any leftover vegetables. 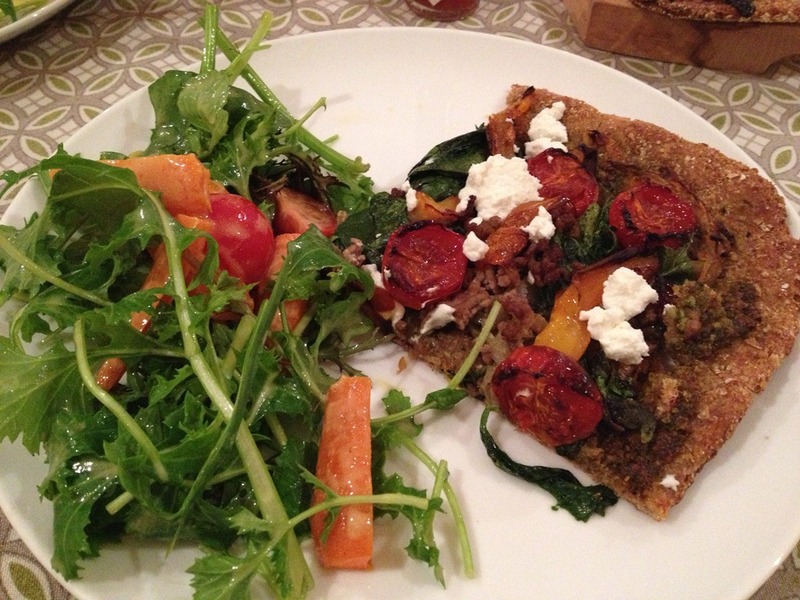 As I have more time on a Friday, I tend to experiment a bit: the pizza on the left is made with a chickpea flour crust, which is almost like a pancake at first but gets a bit firmer when you bake it. 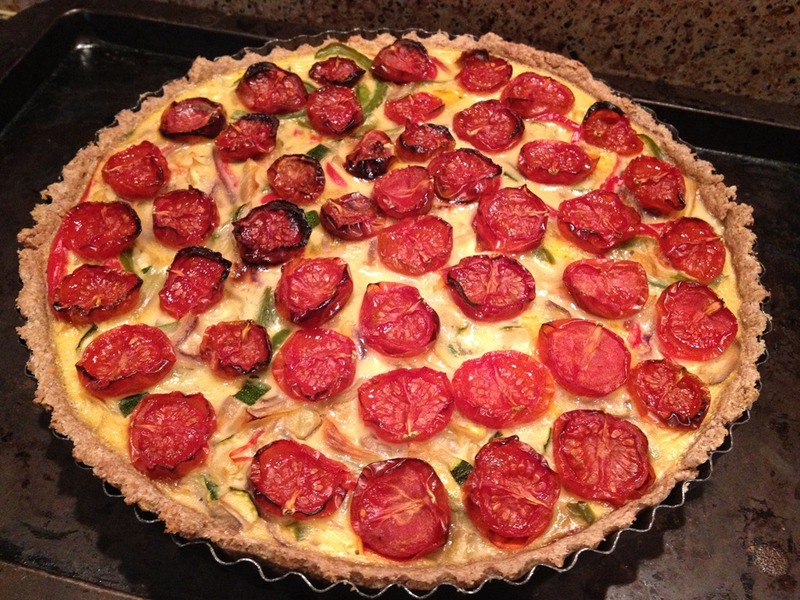 The tart on the right is really my go-to; I roast off whatever veg I have (or sauté if it’s onions/peppers), then toss them into a bowl with a bit of natural yogurt and a couple of eggs and seasoning. 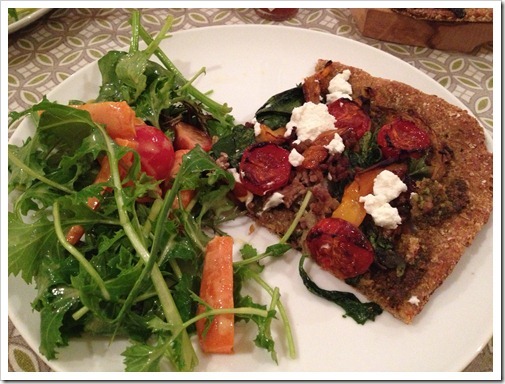 I make a simple crust with wholemeal or spelt flour, olive oil and water, and throw it all together and bake. 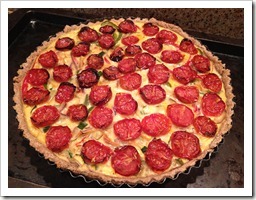 MM loves these tarts and luckily for me, never seems to get tired of them. As we really hate to waste any food, I always try and come with some creative way of using anything we have left in the fridge at the weekend. 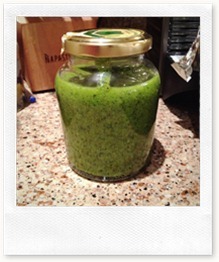 Last week I made this pesto as we had a heap of leftover basil, a bit of parmesan cheese and some walnuts. 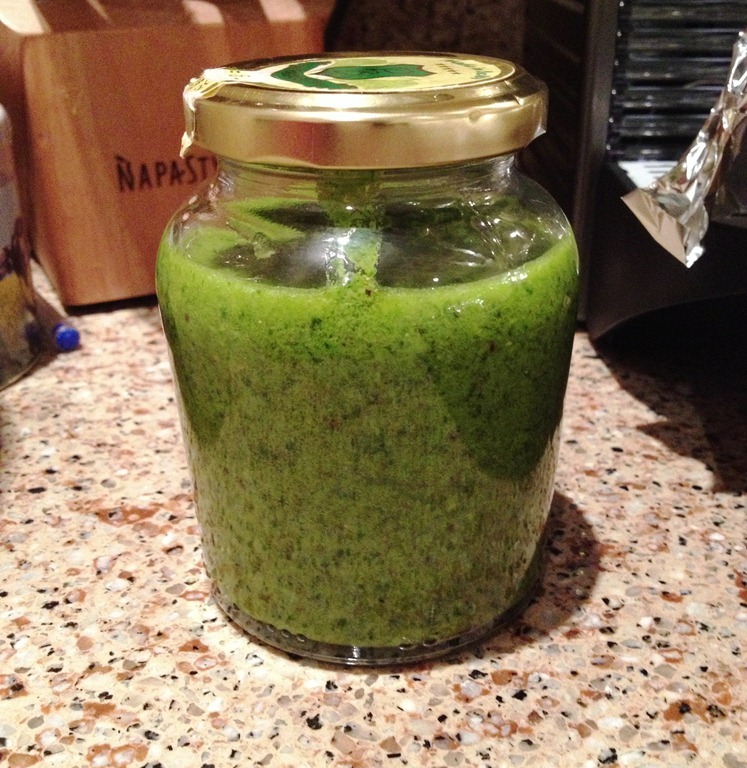 I just blitzed all the ingredients in a food processor with some olive oil and we had pesto all week – some of which I used for the spaghetti above. Sometimes we’ll have a few bananas or pears left at the end of the week, as we buy loads of fruit for my Glowing Green Smoothies. The bad thing about leftover fruit is that it’s often bruised and blackened; the good thing is that bruised and blackened fruit makes fantastic bread. 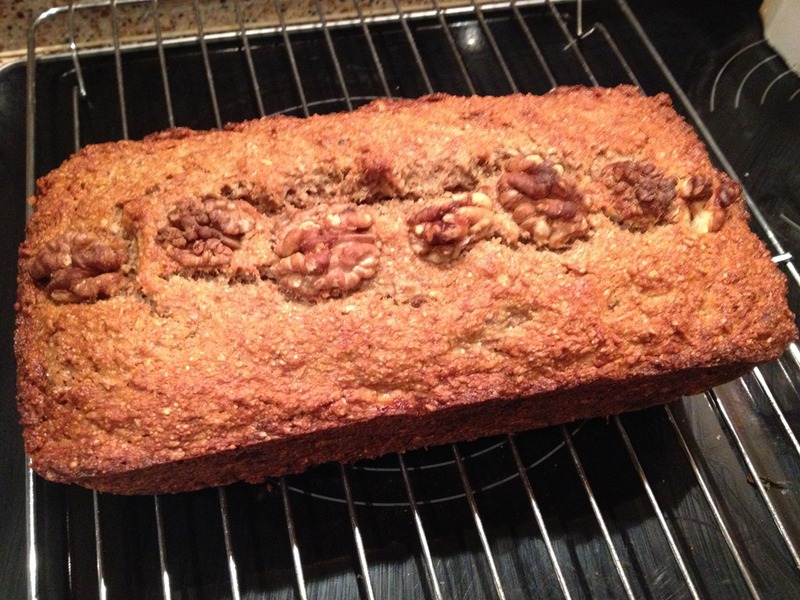 A couple of weeks ago I took three black bananas and a pear and made this easy banana bread with some wholemeal flour, brown sugar, egg and walnuts. We actually gifted it to MM’s folks as we were staying with them that weekend. Basically beat together 2 tablespoons of softened butter with 3/4 cup of brown sugar until fluffy. Add in one egg and three mashed bananas and mix until smooth. In separate bowl, stir 1.5 cups wholemeal flour and 3 teaspoons of baking powder. 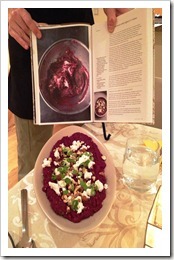 Then combine the wet and dry ingredients and add a handful of chopped walnuts and combine. 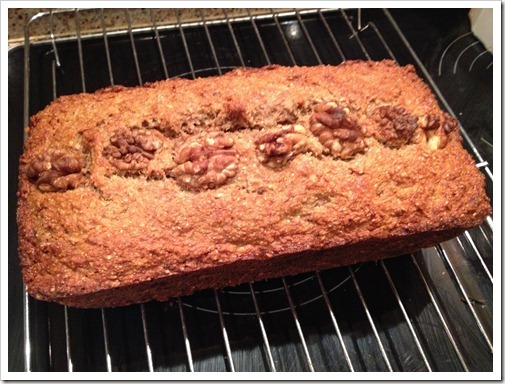 Pour into loaf pan, top with whole walnuts and bake in a pre-heated 200C oven for 40-45 minutes. 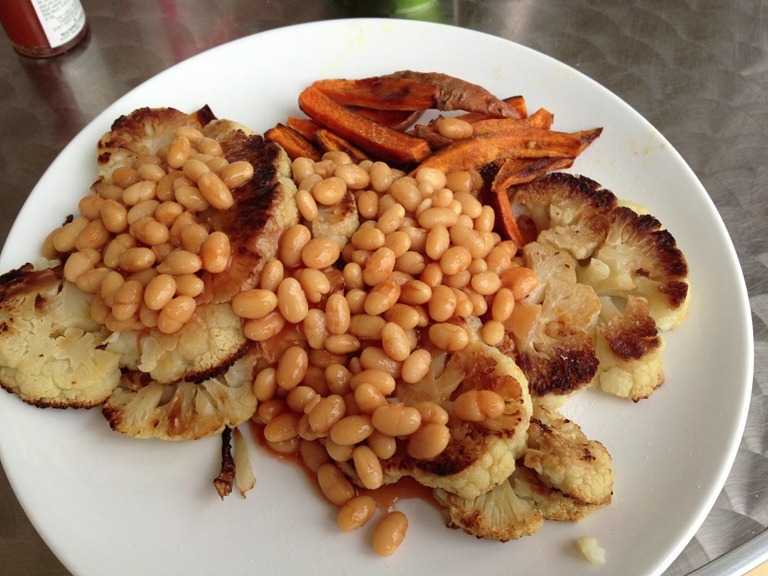 Sometimes instead of going out for a Saturday night meal, we’ll treat ourselves to a more elaborate dinner at home. 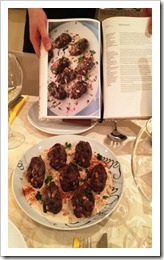 Last weekend we made three dishes from Yotam Ottolenghi’s “Jerusalem” cookbook, which MM bought me for my birthday. 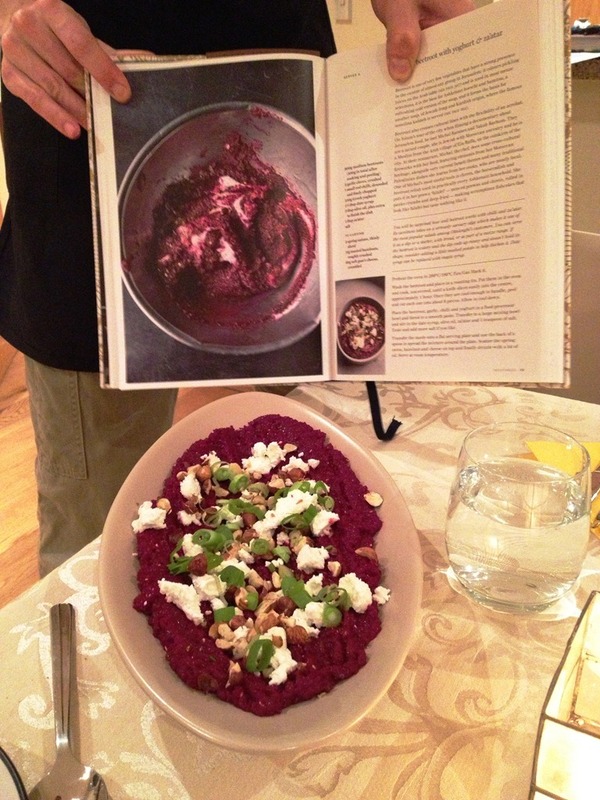 It was so much fun cooking together and creating a gourmet meal out of really simple, inexpensive ingredients. 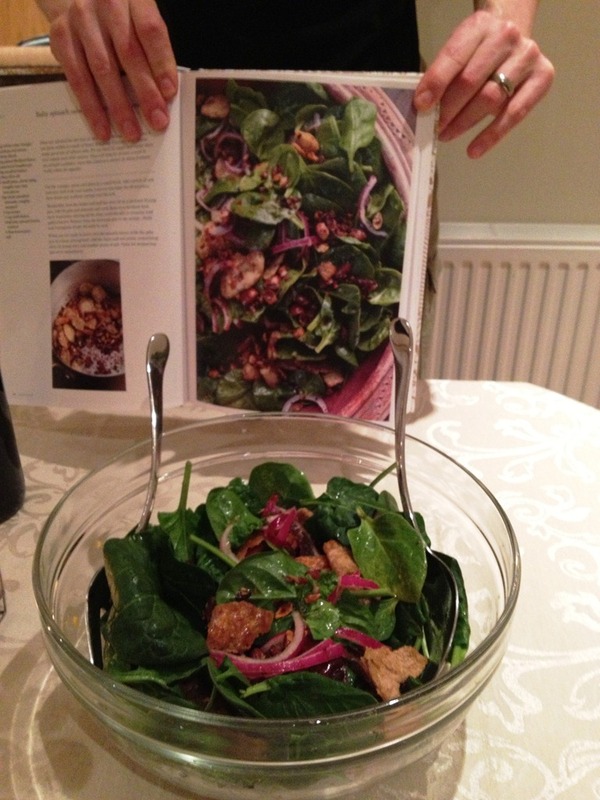 We made the lamb koftas, spinach & date salad and a beautiful beetroot puree with goat cheese and toasted hazelnuts. You can read more about how we worked together on MM’s blog post here. 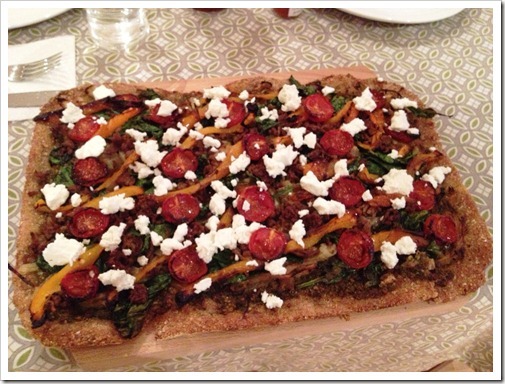 Sunday dinner varies – sometimes we’ll do a simple Asian stir-fry but last weekend I made this Ottolenghi-inspired pizza, as we had several leftover ingredients from the previous night’s meal. I made the crust from wholemeal flour, yeast, chestnut honey and water, and then topped with the leftover lamb mince, roasted tomatoes, spinach, peppers, onions and goat cheese. Again it takes some work, and as we do not have kids we do have more time than those with little ones running around. But I think everyone can do a version of what we do – if you focus on simple ingredients and like to cook, you can make the time to ensure you’re eating healthy, handmade meals whenever possible. Brad: Happy Paddy’s Day to you too(and Komako, Hyuma and Naomi!). 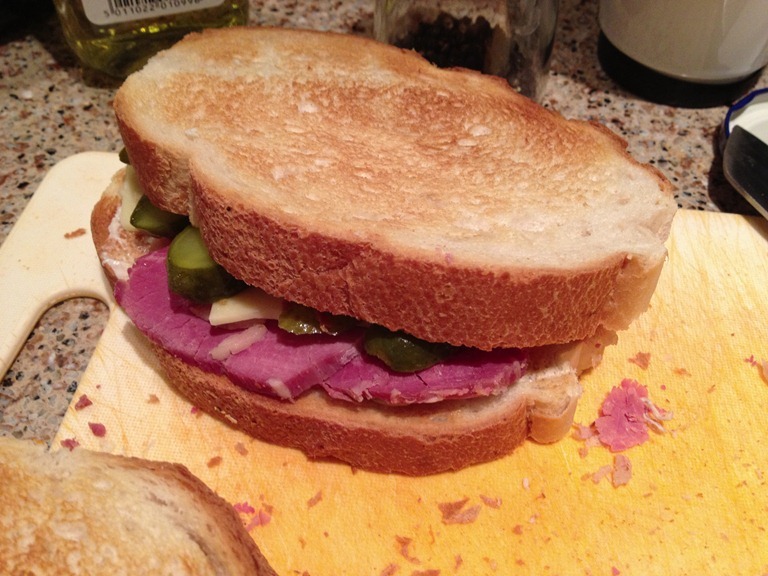 I’m actually boiling a corned beef right now as I type this, for MM’s sandwiches this week – he has recently rediscovered it and can’t get enough. Wish we could celebrate it together as well. Miss you guys! An American in Ireland is powered by	WordPress 4.5.17 and delivered to you in 0.252 seconds using 45 queries.